Not a lot of people know that the great Isembard Kingdom Brunel was responsible for two bridges in Bristol, the Clifton Suspension Bridge and the lesser known Swivel Bridge. Much older than the suspension bridge, the swivel bridge has the distinction of actually having been engineered by Brunel, as opposed to its iconic, loftier cousin – the technical design of which was actually by William Barlow and Sir John Hawkshaw. 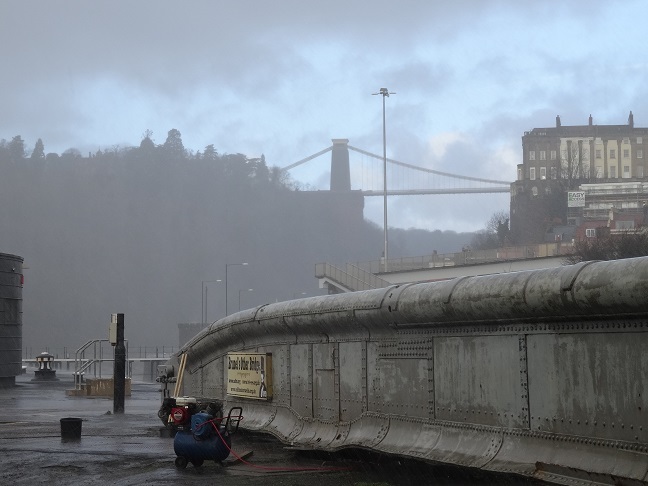 The Swivel Bridge, Bristol’s only abandoned Brunel structure and listed Grade II* is on English Heritage’s Buildings at Risk Register..It was designed to span the entry to the Cumberland Basin, swinging out the way when ships were negotiating the lock into and out of the Floating Harbour. Made of wrought iron, it rotated on four wheels running on a turning ring beneath. It was originally operated by a hand-turned crank; this was later converted to a hydraulic system using a pressurised water system sited in Underfall Yard. The design represents an early stage in the development of the flanged plate girders that characterised Brunel’s later medium span wrought iron bridges. The upper tubular section brings to mind his Tamar Railway bridge. The Avon Industrial Buildings Trust, together with the Bristol Industrial Archaeological Society and the Clifton & Hotwells Improvement Society, are now working on restoring this important structure, which could once again form a useful route for cyclists and pedestrians. A new website – ‘Brunel’s Other Bridge’ – has been set up. The Bristol Buildings Preservation Trust is looking forward to being able to assist in whatever way it can as this fascinating project moves forward.